On a brisk Saturday April night in Baltimore, Jose Abreu poked a single to right field off of Orioles pitcher Vance Worley. The date was Apr. 30, and Abreu's single, scoring Adam Eaton, gave the White Sox an 8-7 lead. The run, however, was charged to Zach Britton, who took the loss. That run was the last of its kind for Britton. Since May 1, Britton sports a 0.00 ERA over 41 appearances. He's saved 31 straight games and has a great 46-14 strikeout-to-walk ratio in his 40 innings pitched. For the season, now, Britton has a 0.54 ERA, totaling 37 saves, leading some to believe that he should be considered for the American League Cy Young award in 2016. Britton has had a phenomenal season no matter how you look at it, but there are flaws in this way of thinking. The Cy Young award goes to the best pitcher in each league. While there are no specifications that it has to go to a starter, since 1956 (when it was first presented), a starting pitcher has won the award in each league every year with just nine exceptions. The problem for Britton is that he hasn't been the best pitcher in the American League. He ranks 36th among AL pitchers in fWAR (minimum 40 innings). One can't even blame that on his workload; Britton is "only" tied for third among most valuable AL relievers. Britton has been worth just 1.8 fWAR this season, so how can we say he has been the best pitcher in the entire league? Britton has only been worth 0.1 more wins than Kevin Gausman this season, who is 3-10 with a 4.04 ERA, 4.35 FIP and a 3.83 xFIP over 21 starts (120 1/3 innings). While I'm not quite comparing apples to apples here, who would consider giving Gausman the Cy Young award this season? Nobody. Sure, there's the whole history aspect that goes into this argument. Britton hasn't allowed a run in 40 straight innings! Britton's ERA is historic, right? Wrong. In 2012, Rays' closer Fernando Rodney posted a 0.60 ERA, just 0.06 runs off of Britton's current mark, in 74 2/3 innings pitched, 24 2/3 innings more than Britton. Perhaps the biggest difference between 2016 Britton and 2012 Rodney was that Rodney was the American League's most valuable reliever, totaling 2.4 fWAR. He also saved 48 games in 50 chances, giving him all the credentials to perhaps be named Cy Young. Long story short, Rodney finished in 5th in the voting. Rodney aside, other Britton supporters like to argue that there has not been a starter worthy of the Cy Young this season. Nobody has stood out, that is correct. But there are many worthy candidates, all of whom post better credentials than Zach Britton. Jose Quintana has posted a 2.85 ERA this season, as well as a 3.42 FIP over 157 2/3 innings pitched, totaling 3.9 fWAR. Aaron Sanchez has a 2.84 ERA and a 3.29 FIP and has totaled 3.6 fWAR. Perhaps Corey Kluber could win the award again, especially with a good run down the stretch, as he has pitched to a very good 3.15 ERA and a 3.01 ERA, good for a 4.3 fWAR. Maybe even Danny Duffy could be the Cy Young. . . There are many other, better options than Zach Britton for American League Cy Young. And by voting for the Orioles' closer, a much better, more qualified candidate is going to be snubbed. Last Thought: Jayson Stark's idea of creating an award for the top reliever in each league that is voted on by the BBWAA would be a great alternative (MLB gives out a relief pitcher award every year, but it is not voted on by the BBWAA) to this madness that is caused by the Cy Young award, which truly is a starting pitcher's award. 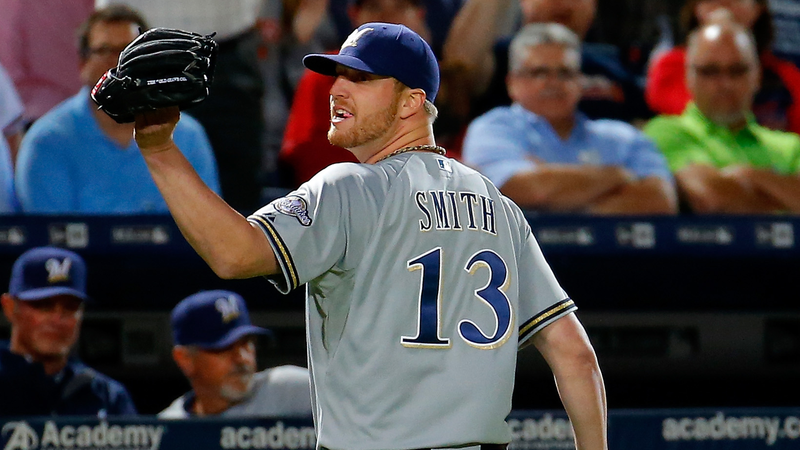 Brewers' pitcher Will Smith and Orioles' pitcher Brian Matusz were both ejected this past week for having a foreign substance on their arms. Smith was suspended--and has since appealed--eight games, while Matusz is still waiting on a verdict. Major League Baseball rule 8.01(a)(4) states that, "The pitcher shall not...apply a foreign substance of any kind to the ball...PENALTY: For violation...the pitcher shall be ejected immediately from the game and shall be suspended automatically. In National Association Leagues, the automatic suspension shall be for 10 games." Foreign substances include mixes of sunscreen and rosin, pine tar, and anything else for pitchers to get a tacky ball, something that will allow them to grip it better. The worst part of all these suspensions and ejections is that hitters tend to not care if pitchers are using these substances. If a pitcher can grip a ball better, they are able to throw it more accurately, meaning less hit batsmen and overall a safer game. Orioles' manager Buck Showalter understands the rule, but is also a main proponent in instituting tackier balls for a safer overall game. "Why is the rosin on the field? Why is it there," asked Orioles manager Buck Showalter, via The Baltimore Sun. "It's a deeper issue than that. You've all heard me talk about the crux of the problem. Same reason hitters have pine tar. We all understand the crux of the problem is gripping the ball; it's not trying to [doctor the ball]." The "foreign substance rule" was implemented to outlaw certain advantages pitchers were gaining through throwing spitballs or, as Showalter mentioned, doctoring the baseball. But when a pitcher's intent is to just grip the ball a little easier, don't you think that they should be allowed to use these substances? Absolutely. But to keep pitchers from doctoring the baseball or using spitballs, MLB cannot get rid of the rule altogether. They would need to tweak it. "I would like to see an approved substance pitchers can use," Red Sox manager John Farrell was quoted as saying via ESPN. "I think anytime a game loses players for eight to 10 games, I think it makes us as an industry look within." ESPN's Baseball Tonight had an interesting segment regarding foreign substances, including an appearance from ex-Athletics pitcher Dallas Braden. Braden said that, during Spring Training, the Athletics would have an "application" station, where pitchers would learn to use these substances, including a mixture of rosin and BullFrog sunscreen. Braden said that he would reapply the mixture after every inning. Braden suggested that they should put a pine tar rag behind the mound, similar to how there is a rosin bag behind the mound. He argues that hitters have weighted donuts, batting gloves, pine tar, and other things to give them an advantage, so why are pitchers limited so much? Even though they may be at a disadvantage, pitchers are still technically cheating. Now, isn't cheating wrong? Is there a little bit of guilt involved? "No. Absolutely not," Braden said. "I've got outs to get."